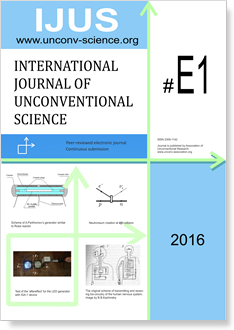 International Journal of Unconventional Science (IJUS) is a peer-reviewed, electronic journal that publishes original and high-quality research papers, surveys, reviews and letters on topics broadly related to boundary phenomena of quantum physics, unconventional information effects, energy, biophysics, medicine, psychology and other disciplines. It supports exchange of ideas and popularization of new interdisciplinary and boundary areas of modern science. IJUS aims at international auditory and intends bringing together researchers from around the world working in these areas; establishing a dialogue between mainstream research and new research areas; involving young researchers; verification and validation of theoretical and experimental data. The IJUS encourages performing replication experiments. The English version of the journal uses the continuous submission approach, where the papers, after a positive decision of peer review evaluation, are immediately published online. This reduces time between an initial submission and the final publication. The journal invites authors to provide medial files (e.g. video) with demonstrations, explanations of experimental setups and other supporting information. Not only videos but also the raw sensor data, obtained during experiments, can be provided and published together with the original paper. This intends to increase a credibility, technical soundness and usability of the conducted research as well as to enable performing replication experiments by independent organizations.